A gunboat was a floating platform for one or more cannon. 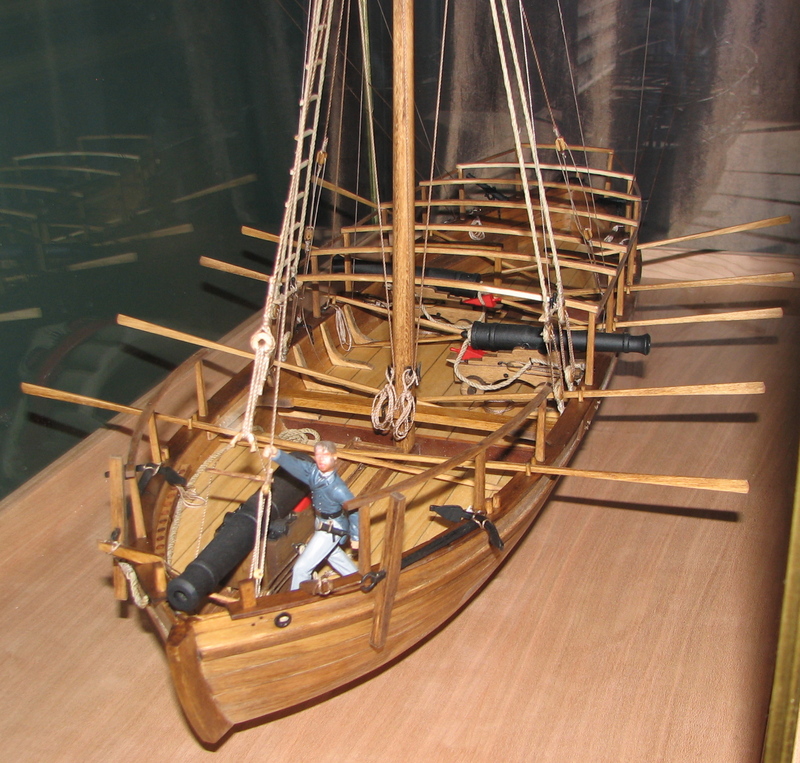 While any boat carrying a large swivel gun or cannon could be called a gunboat, the Revolutionary War gunboat usually refers to a ‘gondola’, which is a boat that has a flat bottom and a pointed stem and stern. 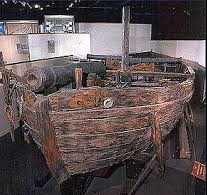 Relying more on their oars than their sails for propulsion, gunboats had the advantage over sailing vessels in that they could direct their cannon without regard to the direction of the wind. With two or more gunboats working together, the American Patriots could use these boats as floating batteries, carrying the cannon to threaten a British ship or maneuvering them to protect a bay or inlet from attack. 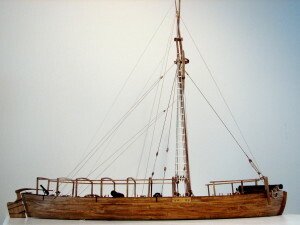 Their flat bottoms made gunboats terrible sailers but also made them ideal for galley fighting in shallow coastal waters and rivers. 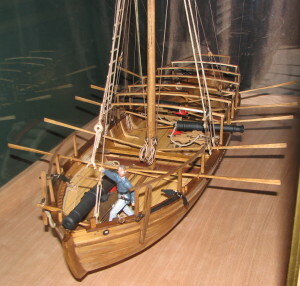 Thomas Paine advocated building gunboats as the core vessel of the Revolutionary War navy, while Thomas Jefferson proposed that America’s Navy should rely predominantly on American gunboats during the War of 1812. The most famous American gunboat was the Philadelphia, which is on display at the Smithsonian Institution’s Museum of American History. The gunboat Philadelphia was sunk during the Battle of Valcour Island and was recovered 200 years later in amazingly good condition. She had been built as part of a flotilla that had been hastily assembled to stop the 1778 British invasion of New York via Lake Champlain. Although the British soundly defeated the Americans on Lake Champlain, the delay the American flotilla created is partly credited with the eventual victory at Saratoga, which is considered the turning point of the American War of Independence. Today is the anniversary of the Battles of Lexington and Concord, so it is fitting to post some new pictures of the gunboat Philadelphia. Enjoy. The Gunboat is finished. I traveled more than I expected as I was building it, and, I carried the tools and materials with me so that I could work on it in Los Angeles, Santa Barbara, Sarasota, and Vero Beach. 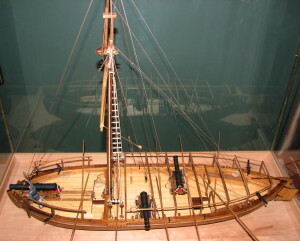 In these pictures, I show only the finished hull, mast and spars. Later I added the oars, which makes for a striking presentation. 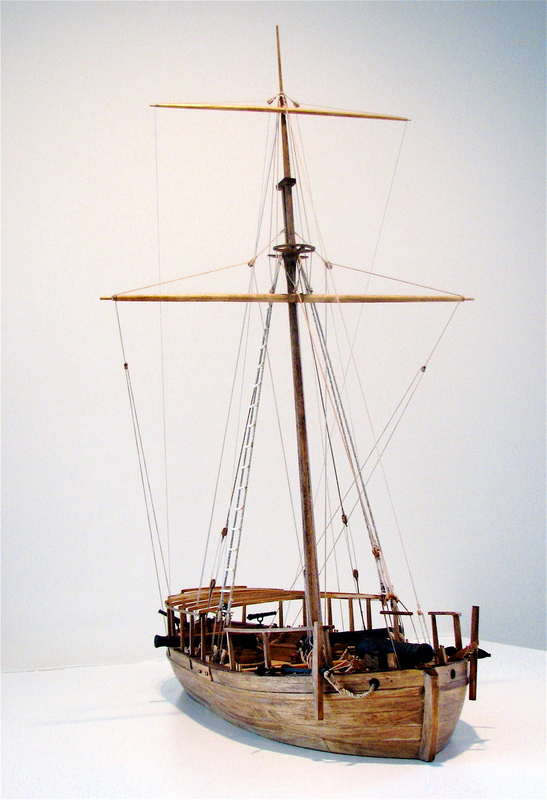 I would take another picture, but the Gunboat is on display at the Quogue Library and I won”t have access to photograph it against a white background until the show ends in April. Still, even without the oars, the results are quite satisfying. Judge for yourself. I am continuing to plank the hull as I work on the guns, i.e., the cannon, that give the gunboat it’s name. There are three, a large 12-pounder and two 9-pounders. 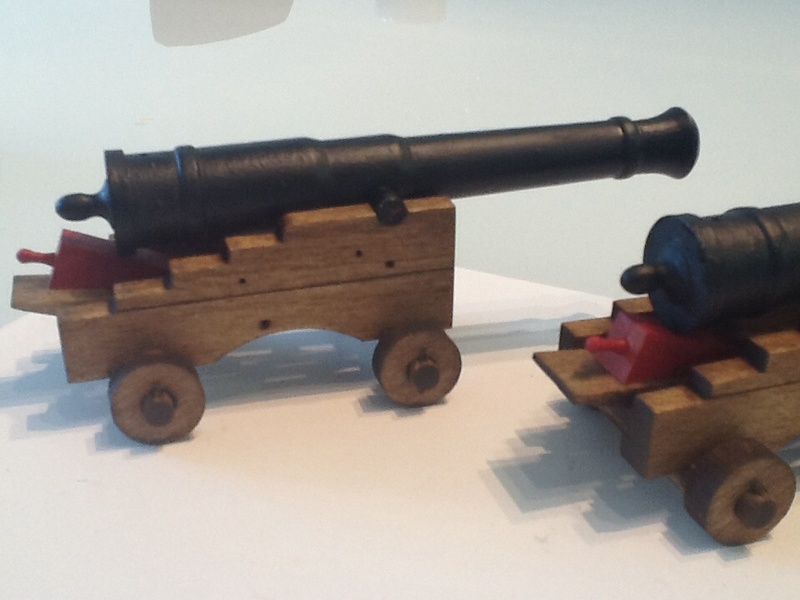 The ‘pound’ designation refers to the weight of the cannon ball that the gun can fire. The 12-pounder will be fixed onto a slide at the bow, (the front of the boat), which limits it to pointing wherever the boat is headed. That’s useful when the boat is attacking but of no use in a retreat. The 9-pounders face out over the sides of the boat, one to each side. 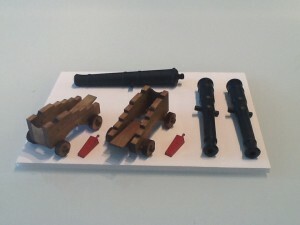 Since these are set on carriages, they are somewhat more maneuverable. I suspect that in a pinch, the captain may have been tempted to place the two guns on one side so that they could both fire in the same direction, but I would not have wanted to answer for the consequences of firing two large cannon simultaneously over one side of a small flat-bottomed boat. 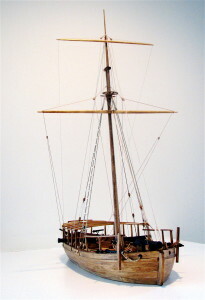 Although my gunboat model is a replica of the Philadelphia, I will use it to represent the kinds of boats that patrolled the American rivers and coasts and which participated in the some of the battles between Patriots and Loyalists on Long Island Sound. In several accounts of the fighting on Long Island Sound, I have read about battles or troop transports being conducted on ‘whaleboats’ that carried 30 to 50 men. These were probably not whaleboats, which were designed to carry only six men and could carry only a few more in a pinch. Instead, I suspect that these were large gondola-type gunboats, which might look like whaleboats from a distance, but were significantly larger. At 1:24 scale (1″ = 24″), this will be a large model (about 33″ long) with a scale man being about 3″ tall. 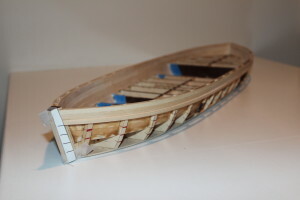 Only two weeks into the model-building process, the hull and some of the planking are almost completed. 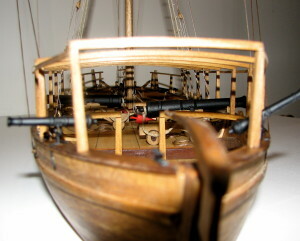 This model will be ready for display at my lecture on the Ships of the American Revolution at the Quogue Library on March 23, 2014.